The rainbow is the most commonly observed example of dispersion. The scientific explanation is that the sun light is first refracted entering the surface of the raindrop, reflected off the back of the drop, and again refracted as it leaves the drop, splitting the white light into a rainbow that is observable to the human eye. This phenomenon that white light is separated in different colors to form the rainbow is named dispersion. In fiber optical communication, which is equivalent to the example relating to the rainbow above, dispersion causes different wavelengths, or colors of light, to travel at different velocities in the fiber. The short wavelength components travel faster than the longer wavelength components, thereby broadening the signal and eventually making it difficult to distinguish a 1 from a 0. Interestingly, the sensitivity to dispersion scales with the square of the data rate. The sensitivity deteriorates 16 times in the transition from today’s widely deployed system of 10 Gbit/s to 40 Gbit/s. An increase from 40 Gbit/s to 100 Gbit/s further increases the sensitivity to dispersion by a factor of 6.25. 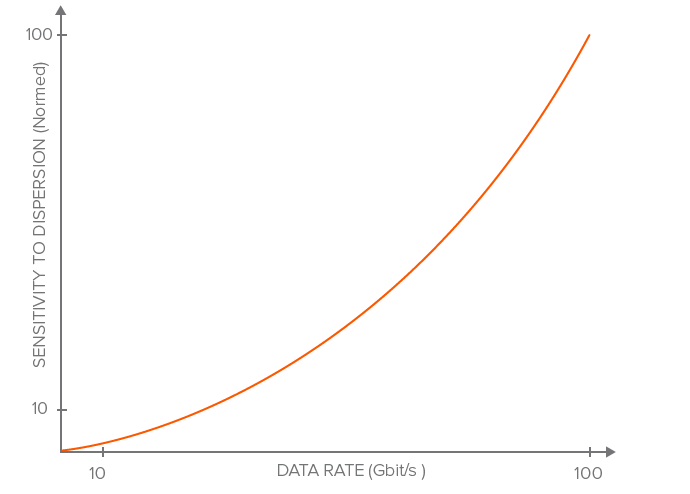 Consequently, the sensitivity to dispersion increases by a factor 100 with the ongoing transition from 10 Gbit/s to 100 Gbit/s. Chromatic dispersion: Glass fibers transmit light of different wavelengths at different speeds. Chromatic dispersion is caused by the combination of material dispersion and waveguide dispersion. – Material dispersion: Glass fibers exhibit the property of different wavelengths of light exhibiting different indices of refraction and, therefore, travel at different speeds. – Waveguide dispersion: In single-mode fibers, a portion of the light travels outside the core of the fiber, which has another index of refraction, therefore, broadening the pulse. 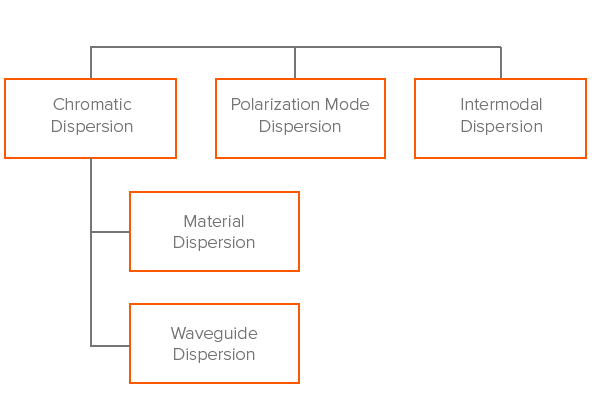 Polarization mode dispersion: Light pulses are composed of two distinct polarization modes, which normally travel at the same speed, traveling at different speeds due to random imperfections and asymmetries, causing random dispersion of wavelengths. Intermodal dispersion: Each mode of light travels a different path, some shorter and some longer distances. As a result, the modes will not be received at the same time and the signal will be distorted. Dispersion generally means broadening or spreading of light. In the world of fiber optical communication, it means that all the photons that are sent out simultaneously to form a short, distinct pulse of light, require slightly more or slightly less time than other photons to travel through the fiber, thus not arriving simultaneously at the receiver. The pulse that initially was short, high, and sharp has become a bit wider, lower, and less distinct. If only one pulse is sent, no problem will arise, however, if several pulses are sent within a close interval, the pulses will eventually start to overlap each other and bit errors will occur.